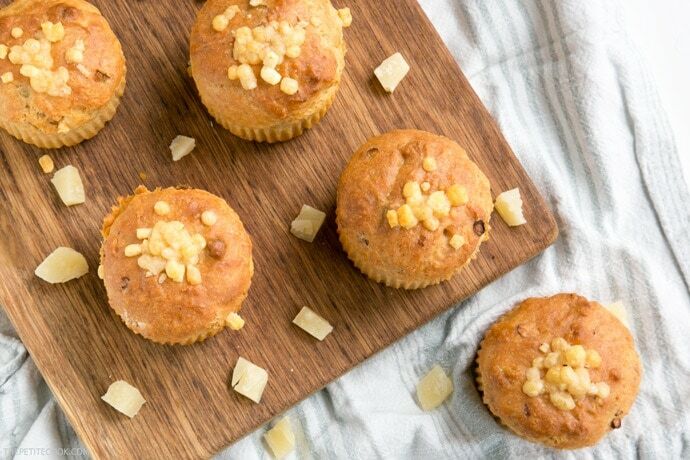 Make these Cheesy Parmesan Beer Muffins for a great grab-and-go snack or make-ahead lunchbox option – Super fluffy, packed with flavors and no butter or eggs required! 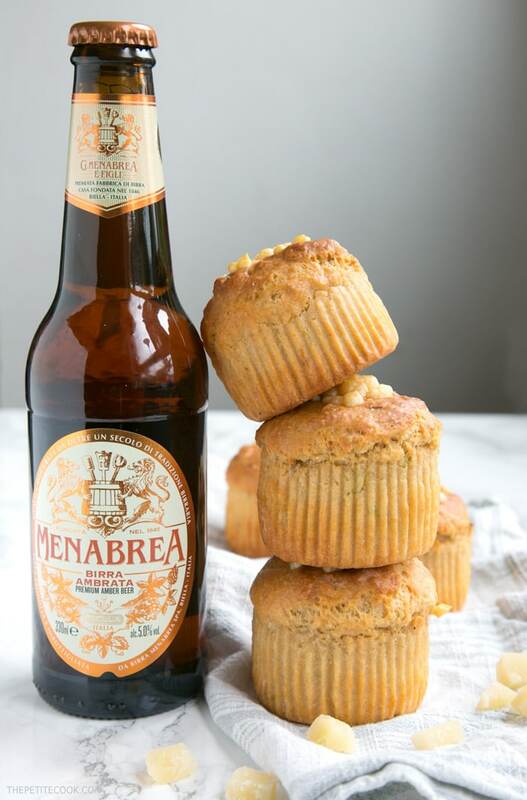 I like to prepare these irresistible beer muffins during the weekend, so that I have a quick snack on hand for the week ahead. They’re bold in flavor, savory, and extra cheesy. From all the savory muffins I tried, these are probably my favorites. It must be the umami-rich parmesan cheese. And of course, the beer. I’ve used the Ambrata from Menabrea, the most ancient brewery in Italy. The Ambrata is a well-balanced craft beer with a nice depth, marked floral fruitiness and a slightly bitter undertone. You can really taste its delicious flavor in the muffins. It also works well for meat marinades and of course, on its own served super chilled. I have made the muffins with extra virgin olive oil. But they work well with the same amount of melted butter, so use whichever you prefer. You could also add a handful of chopped fresh herbs (such as thyme or rosemary) to the mixture if you feel like it. And if you don’t like Parmesan cheese (seriously?! ), try mature cheddar or your favorite hard cheese. 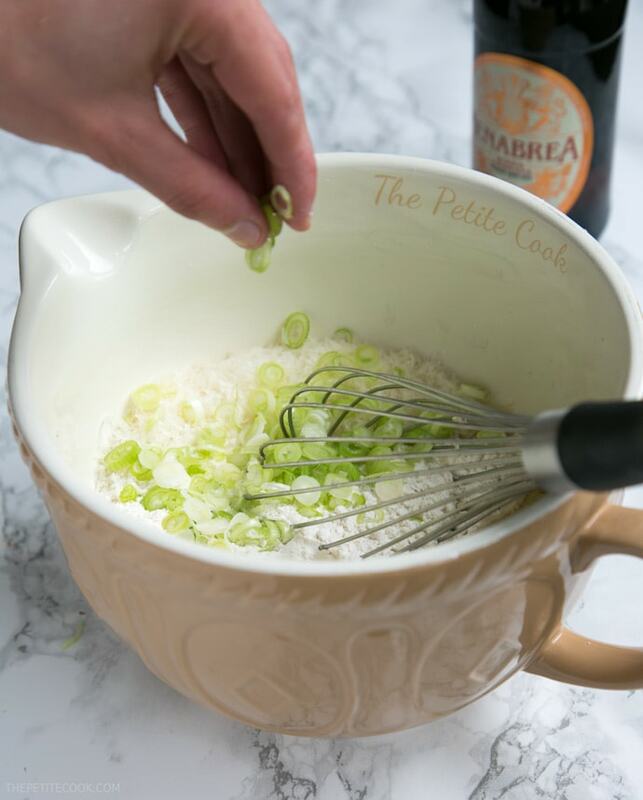 These awesome cheesy parmesan beer muffins only require one bowl and take 5 minutes to throw together. Ready in just 20 mins, they’re a total breeze to prepare. Start by mixing the dry ingredients in a large bowl. Then add freshly chopped spring onions. Now fold in the olive oil and pour over the beer. Give it a good mix and pour in the prepared muffin tin. Before you know there will be a big batch of fully flavored beer muffin on your table, all ready in less than half an hour! If you’re looking for a batch of muffins to freeze and put into lunch boxes during the week, these guys freeze beautifully. They also make a handy choice for quick vegetarian (if use parmesan-style vegetarian hard cheese) lunch or a snack to take on with you on a day out. 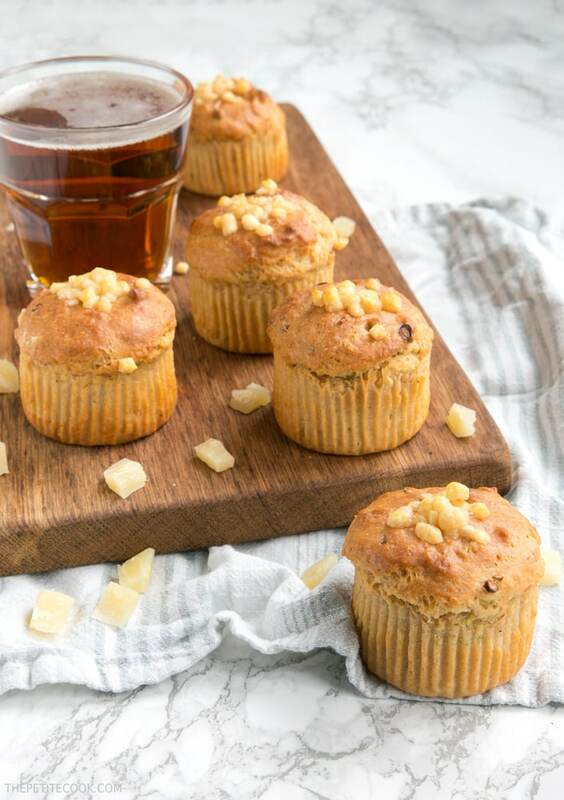 These Cheesy Parmesan Beer Muffins are a great grab-and-go snack or make-ahead lunchbox option - Super fluffy, packed with flavors and no butter and eggs required! Preheat oven to 180C/350F and spray the muffin tin with cooking spray. In a large bowl combine all the dry ingredients and cheese. Fold in chopped spring onions and olive oil. 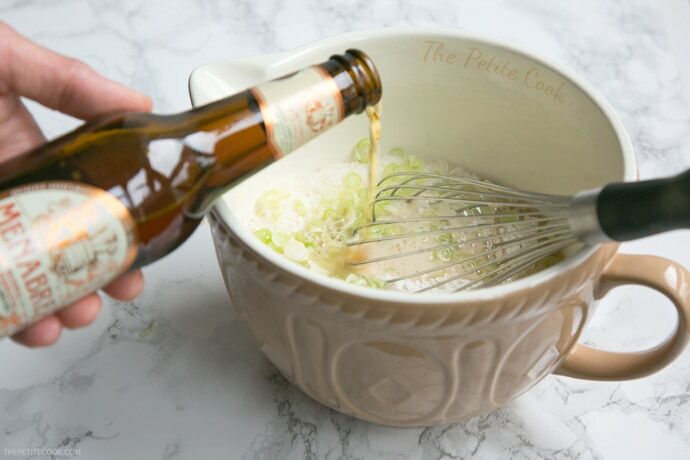 Then pour in the beer and stir until just combined. Pour the prepared batter into muffin tin, filling about ¾ of the tin. Add extra cubed cheese on top of each muffin. Bake for about 18-20 minutes or until the muffins have raised and a toothpick insert in the center comes out clean. Serve immediately or slightly chilled. Freeze them individually for later use, for up to three months. I adore savoury muffins, don’t think I’ve ever come across any with beer! Sounds awesome! 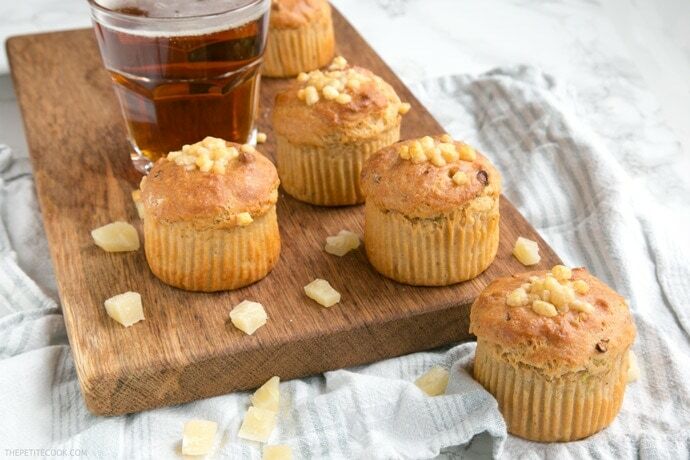 I love the sound of these cheesy beery muffins! The beer sounds really nice – I’ll keep an eye out for it and I’m glad it’s veggie/vegan. It’s a lovely beer 🙂 It’s just a bit tricky to find around in UK! With Oktoberfest upon us, I’ve been looking at ways to incorporate beer into recipes. I would be making a gluten-free version. These sound great! Oh my gosh! What delicious looking muffins! My husband and I were just talking about Oktoberfest and pretzels and beer themed things, I’m going to make these for him! Thanks for posting! Oh Boy! Beer and cheese ? what a great pairing ! Would be curious to know how it tastes like. YUM! I have one or two beery cheese fans who would love these! I’ll be replacing the parmesan with a good vegetarian cheddar but otherwise we’re good to go! I’m delighted to read that Birra Menabrea is suitable for veggies and vegans, hoorah!